The autonomous vehicle space mainly comprises of sensors, platforms, features, data engineering, mileage validation etcetera. Significant technology and business model innovations are being witnessed in each of these component areas, with a large number of new players bringing unique solutions. In addition to this, important functional areas such as vehicle integration, safety regulations, functional safety and security are being discussed in all forums as part of the autonomous drive. Much like the component space, the functional areas are also exploding with possible solutions and trade-offs. In all of this, one key area that has not been brought to attention yet is the role of system engineering in the ecosystem, especially from the perspective of safety and system integration. In most cases, the clear value of system engineering has not been realised as the terminology itself is a new addition for the automotive industry. After having missed it initially, the leaders in the aerospace industry took strong initiatives to embed system engineering into the “product development life cycle”. Eventually, other adjacent industries such as railways, medical, and mining started adopting system engineering as a functional area. With autonomous vehicle programmes on the radar, one cannot afford to overlook it. System engineering, as aforesaid, is a new functional area, which was introduced for the need of better safety standards. OEMs and Tier 1s have been slow to adopt it, given the absence of foreseeable insights on the return on investment, which the function can generate. Moreover, the understanding of the scope of system engineering has been different for different players. Therefore, it is extremely important to create library of scenarios and create models to validate features before the testing takes place on road. The major contribution of scenarios and scenario models are not only for performance validation but also in requirement validation and requirement articulation. Furthermore, several non-functional and performance requirements are driven from use cases, which bring significant values in autonomous vehicle development. System engineering not only assures safety and reliability of the product but at the same time is critical for optimising cost. The systematic process of defining the requirements, use cases and their corresponding test cases and test procedure is the key aspect that regulations demand in safety critical systems. This makes system engineering an inseparable process and element in the development chain. The system engineering process is one of the key processes in the autonomous vehicle system development cycle. A standard process flow incorporating major aspects of system engineering has been described in the process flow diagram. The system engineering process includes a step-by-step development approach for the three key aspects of system engineering: requirement engineering, architecture development and functional safety. The outcome of this process is system engineering artefacts such as requirements, architecture and safety goals. There are other intermediate artefacts generated in the process that are enablers for low level design and development activities. In the current development scenario, architecture is done independent of the requirements, and similarly safety analysis and safety design are done independent of requirements and architecture. The effectiveness of doing all independently is less as compared to having them evolved through a step-by-step process. The architecture and safety analysis drives completion in requirements and use cases. The system engineering process assures development of all relevant artefacts that are essential to fulfil the mission and operational scenarios of the system under development. The use cases and scenarios developed through this process are used for defining requirement as well used in verification and validation of activities. In addition, the process enables creation of interfaces documents between functions. A list of interfaces between the different functions in architecture also gets created simultaneously with their appropriate attributes. While system engineering has been a key functional area in the aerospace and other mission critical and safety critical systems, it is also important to adopt system engineering as key functional area in the automotive industry, especially in development of autonomous vehicles. System engineering is the base of all key elements like sensors, platforms, networks, actuations, feature software and functional safety. It not only provides values in assuring safety and reliability of the product but at the same time is the key element to optimise cost and development cycle. 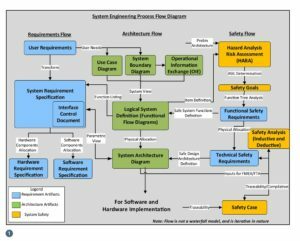 The systematic process of defining the requirements, use cases and their corresponding test cases and test procedure is the key aspect that regulations demand in safety critical systems, making system engineering a key process and element in the development cycle. The system engineering process defines detail requirements, architecture diagrams, and safety cases and also defines the interaction between all these. By creating the detailed requirements, architecture and safety cases during the beginning phase – which is the system engineering phase – the development as well as verification and validation cycle time get reduced.